As a 24 year old guy, I'm not exactly up to date on my gal lore, American or Japanese. So, to catch up, I decided to start hanging out with a bunch of 14 year old girls to see what secrets I could unearth. I planned to follow them around all day, every day, from school, to their club meetings, and while they shopped, recording their every move, public and private. But that's probably illegal. And wrong. And illegal. At least, it should be. Plus, my girlfriend wasn't too keen on the idea. She thinks I shop too much already. So I got Super Gals, instead, and I'm rather glad I did. 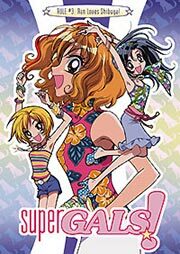 Following the adventures of Ran Kotobuki, the number one gal in Shibuya, and her teenage companions, Super Gals is bright, cheery, and merges wit with slapstick comedy. In the third volume, Ran's dominance of every ko-gal's (somewhat like the analogue to the Valley Girl, see the two volumes of the Short Cuts manga for more info) paradise is once again asserted as every guy in the city enters a grueling competition to win her approval. Her ego is further inflated when an impressionable younger girl comes all the way to Ran's domain to become the elder gal's disciple in the ways of gal-dom. Even though I've suggested that the show is a bit of a worshipping session for the main character, Ran is actually a very good person. Hailing from a long line of police officers, she helps those in need. Whether a person is being assaulted by street toughs or is merely wearing unfashionable clothing, the great Ran Kotobuki is swift to administer the wrath of justice. None of the characters are as vapid as the show's set-up implies. There is a surprising amount of depth to each one of Ran's friends, and while this is mostly a comedy, the occasional bit of drama can sneak in and not seem out of place. It's an odd mix at times, but it always works to a charming degree. The animation for this newer show is smooth and quick, adequately keeping pace with the writing. Colors are varied and bright - the set designers aren't afraid to use plenty of pink, green, and yellow for the walls of schools, homes, and the streets of Shibuya. Character designs are exaggerated (super thin bodies, dishpan eyes, and other anime stylistic hallmarks), but it work well for the series. The music is pretty catchy, too. Days after I finish watching an episode, I can still hear the perky themes bouncing around in my mind, but they're good enough that my sanity remains intact. Well, as much as it usually is, at least. I'm a big fan of the opening and the ending themes, so if I can find a soundtrack domestically, I'll pick it up. I listened to the original Japanese version for this review, but those of you who enjoy the English dub are in for a treat - it's been mastered in 5.1 surround sound. One thing about the Japanese track that's impressive is the speed with which the voice actresses can deliver their lines. Ran always has a lot to say and not very much time to say it, but her real-life counterpart does a fine job of speaking clearly and quickly. There's a nice assortment of extras for this volume. This time around, there's a poster and character profile for Yuya Asuo, whom Ran affectionately calls "Number Two." On the back of the mini poster, there are cultural reference notes in addition to translations of the various types of gal-speak that is used throughout the show. Impress your friends by exclaiming that something is chobaka (that is, super dumb, not the Wookie). On the disc, there's another segment of the "Super Gals explain it all" featurette (dubbed in English only), as well as clean opening and closing animations and production sketches. Not too bad for a mid-series release. On many levels, this is a very entertaining show. It's funny and pretty to look at, and while it may not teach you any applicable life lessons, it may actually give you an idea of how the above average Japanese gal spends her time. With Super Gals, you can live vicariously through Ran and her cohorts without all the shopping, and we can all probably stand to save our hard-earned cash.